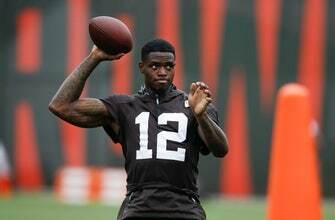 CLEVELAND (AP) — Josh Gordon kept his word and “humbly” returned to the Cleveland Browns. All they can do is hope he stays clean. The former Pro Bowl receiver Saturday ended an extended absence from training camp to deal with his health. He has missed most of the past four seasons because of numerous violations of the NFL’s substance-abuse policy. He posted a statement on Twitter addressed to “Cleveland Browns and NFL family,” saying he was ready to be with his teammates. “I took the time needed to ensure my overall mental and physical health,” said Gordon, who thanked the NFL, the players’ union, the Browns, the University of Florida and his business manager. “This has by no means been an easy road and I’m extremely grateful to have all of you in my life,” he added. Gordon, who has missed 54 of Cleveland’s past 64 games, is not facing another suspension but he’s limited during the initial stages of his return. NFL spokesman Brian McCarthy said Gordon can participate in meetings and conditioning. A team spokesman said Gordon was at the team’s facility in Berea, Ohio, and took part in meetings and worked out with his teammates Saturday. He is not expected to join them on the field for several days. With Gordon, the Browns could have one of the league’s most talented receiving groups. They signed three-time Pro Bowler Jarvis Landry, drafted Florida speedster Antonio Callaway and are excited about the progress Rashard Higgins has made this season. Cleveland also has interest in receiver Dez Bryant. The former Dallas star visited the team this week, and the sides remain in discussions about a possible contract.